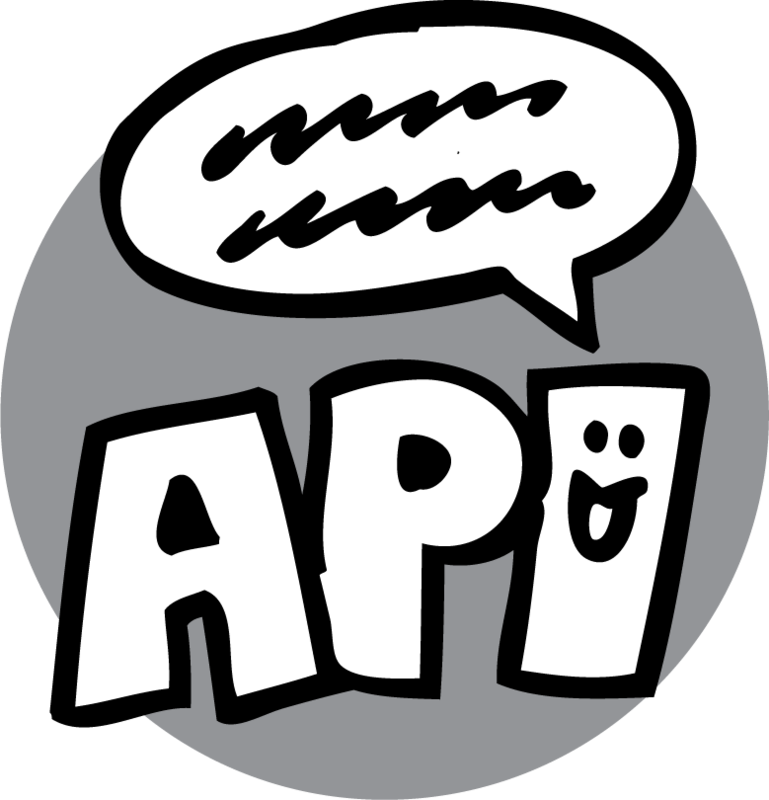 API stands for Application Program Interface, but it might as well stand for “Awesome Possibilities Increase” because it enables you to do all sorts of exciting things with your Resource record data and opens up a world of new options for what you can do with the service provider information you curate. An API provides a way for web and application developers to access and display, in their own creative way, resource data housed within iCarol. These developers can query, or ask questions of, the resource data in your database that’s made available to them through the API, and iCarol will answer by responding with the resource records that match their request. 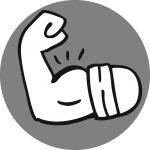 This advanced tool allows them to be creative and do things like create resource directories, search tools, resource lists or any other application that displays or uses resource data. Like other areas of iCarol, our Resource API undergoes regular maintenance and enhancements through periodic releases, and lately our team has been very busy making the Resource API better than ever! What have we done for you lately? 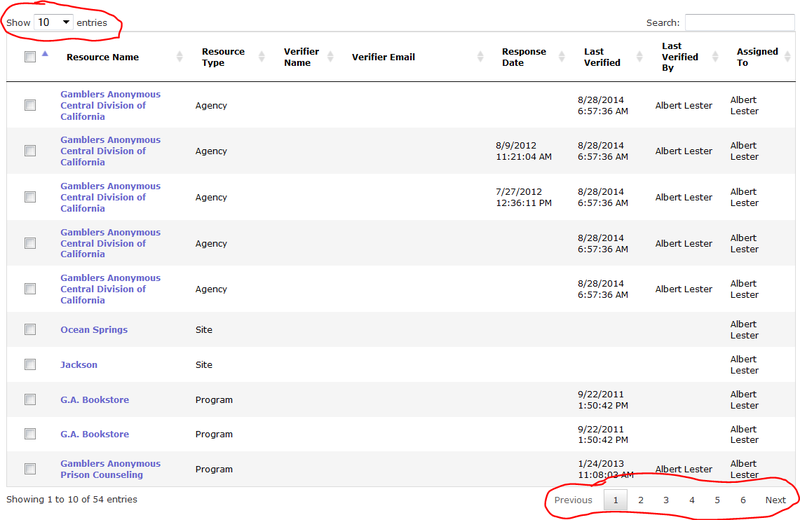 One of our enhancements has the Resource API working with another iCarol feature, Automated Resource Verification. Automated Resource Verification enables you to ensure resource accuracy while simultaneously saving hundreds or thousands, depending on the size of your resource database, of hours of staff time spent updating records. Using this feature, Resource Managers can generate batches of resources due for verification or updates, and send a verification request to contacts who work at those programs and agencies, requesting their input on the record information. The email includes a hyperlink that, when clicked, provides the contact with a live look at the information on file in the iCarol database. This contact can make suggested edits and submit them directly on this web page. 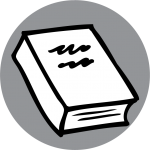 When this request arrives back in the iCarol system, Resource Managers can review the submitted information, and make their own changes and edits, before accepting the verification. 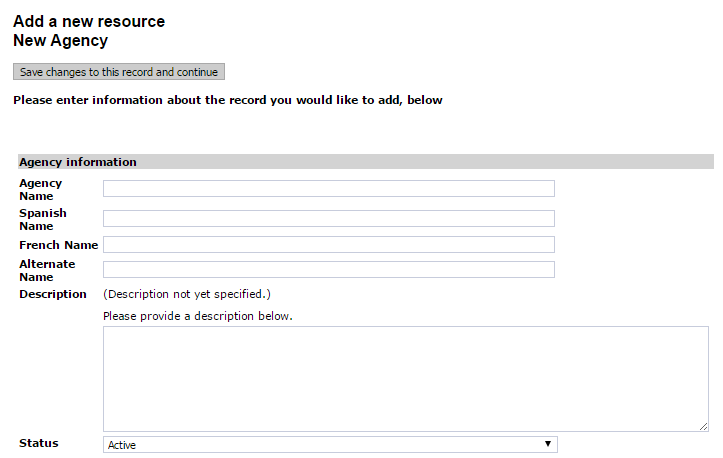 Once accepted and applied, the resource record reflects all of the updates with the click of a button. 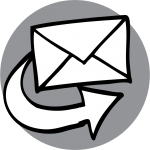 This solution is far better than spending time playing phone tag, sending manual emails, or sending out mailers and then updating records manually, field by field, when you finally receive responses. The Automated Resource Verification feature not only saves you time and money, but your resource contacts will appreciate the convenient process through which they can update their information and ensure clients are receiving the right information about their services. With this new development to the Resource API, your web developers can create a process for your public users to automatically send a verification request to a service provider, prompting them to begin the verification process. Because the Resource API gives you the control to choose when, and who can send requests you can have your web or application developer create a process that meets your unique needs. Overall, being able to initiate new AVR requests using the Resource API gives you another way to ensure your resources have the most recent and accurate information available. There are over 100 different “standard” fields available for use in your iCarol Resource Database which allow you to track and curate resource information you need to help your community. Some of these fields include Phone Numbers, Address, Languages Spoken, Description of services, etc. are of these are commonly used in the industry and describe what a service is, how it is offered and who it serves. 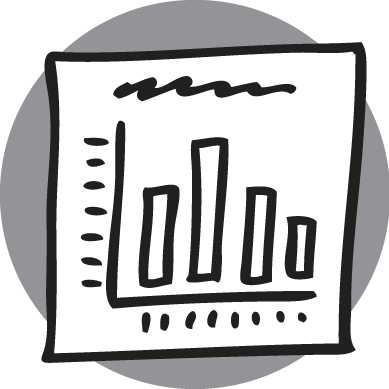 However, many of our customers also use Custom Fields in their resource records to collect and display additional information that does not fit perfectly in a standard field. Custom Fields are often used to track additional eligibility, contact information, updating priorities, and to create custom filters for call and chat specialists to refine search results. With this enhancement to the Resource API, the resources returned from a API request can be filtered by the resources with a specific custom field selection. This allows you, among other things, to create subject-specific Resource API Portals, which you can use to harness your data on your own website, and even to access new revenue opportunities with partners wanting subject or issue specific resources. For example, you may have a partnership with a local service provider such as a domestic violence shelter or LGBTQ center, who would like to display a subset of your resources on their website or in an application they are building. 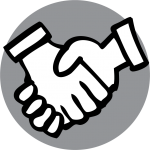 They know and trust the great work you do curating a resource database, and they don’t want duplicate your efforts. They would like to contract with (and pay!) you to access your resources by subscribing to a Resource API Portal that has filtered results, of just resources that you have identified as serving their communities. With all the time and effort you spend collecting, updating, maintaining, and curating resource information, you could and should leverage it to improve your service offerings and get more funding for your organization. The iCarol Resource API is a great way to expand the possibilities of what you can do with your resource data, and these latest enhancements go even further to boost your ability to help the public or explore new partnerships and revenue streams. To find out more about the Resource API, including these new enhancements, check out the Help area of iCarol, or contact our Support Team if you have specific questions, or want to start using the Resource API at your center. Resources that are organized and have a hierarchical structure are going to be much easier to navigate, whether you are a Resource Manager looking to make updates, or an I&R Specialist finding referrals for a client. In iCarol we follow the structure put forth by the Alliance of Information and Referral Systems (AIRS) called Agency, Program, Site structure. You can read more about this structure here. The most detailed and complex way of organizing your referral database is to include the ProgramAtSite record in your hierarchy. This record connects exactly one Program to exactly one Site. That is to say, at a particular Site location for an Agency, a Program may be offered at that Site. And details about the way this Program operates at this Site may vary from the way that Program operates at a different Site. ProgramAtSite records can include detailed, nuanced information about the way this Program operates at this Site. Conversely, a ProgramAtSite record may simply contain only the information that this Program is offered at that Site, and nothing more. 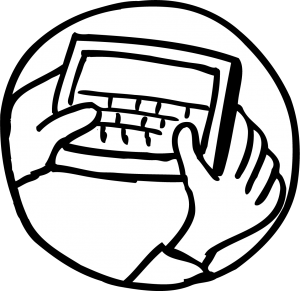 When you go into your iCarol system, edit a Program record, and designate which Sites offer this Program, you’re essentially creating ProgramAtSite records. But sometimes these ProgramAtSite entries that describe a simple link between a Site and the Programs offered there may not be considered true, fully fledged ProgramAtSite records depending on your organization’s policies, and having them treated as such in your helpline software may unintentional skew your results when analyzing the number of records you maintain, the staff hours needed to keep records up-to-date, etc. In a recent release to iCarol, we created the ability for our users to say whether a ProgramAtSite record is a Link Only, meaning it is not edited or maintained by your resource managers or editors. Link Only ProgramAtSite records cannot be edited and will not contain detailed information about how this Program operates at this Site, just that the Program is offered at the Site. This feature is currently available to any of our users who employ the ProgramAtSite record level to their resource database. If you’re not yet using an Agency, Program, Site structure in your iCarol resource database, please contact our support team for assistance. Note: If in the future you disable the Link Only ProgramAtSites feature, all existing Link Only records will be automatically converted to standard ProgramAtSite records. Note: Not selecting the Link Only setting will create a standard ProgramAtSite record by default. Now that you’ve created these records that are Links Only, you may find from time to time that you’ll need to convert them back to being full, editable ProgramAtSite records. Link Only and Standard ProgramAtSites can be converted from one to the other when editing the ProgramAtSite record. When converting from a Standard to Link Only ProgramAtSite all field values on the record will be cleared, and editing of the Link Only record will be restricted. Click on the “Convert to [record type] ProgramAtSite” link above the ProgramAtSite Name field. Click “Ok” from the confirmation dialogue window that opens, and the record will automatically convert. 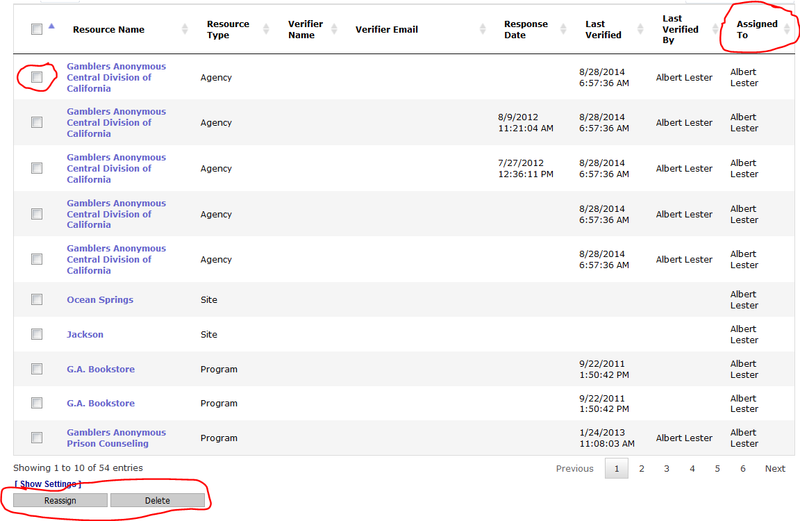 You may be asking, how does this new enhancement impact my Automated Verification requests? Link Only ProgramAtSites will be sent merged with the Program record, even when the Automated Verification Request, Setting #6 “Send verification request to ProgramAtSite contact if one exists, otherwise Program Contacts” is selected. 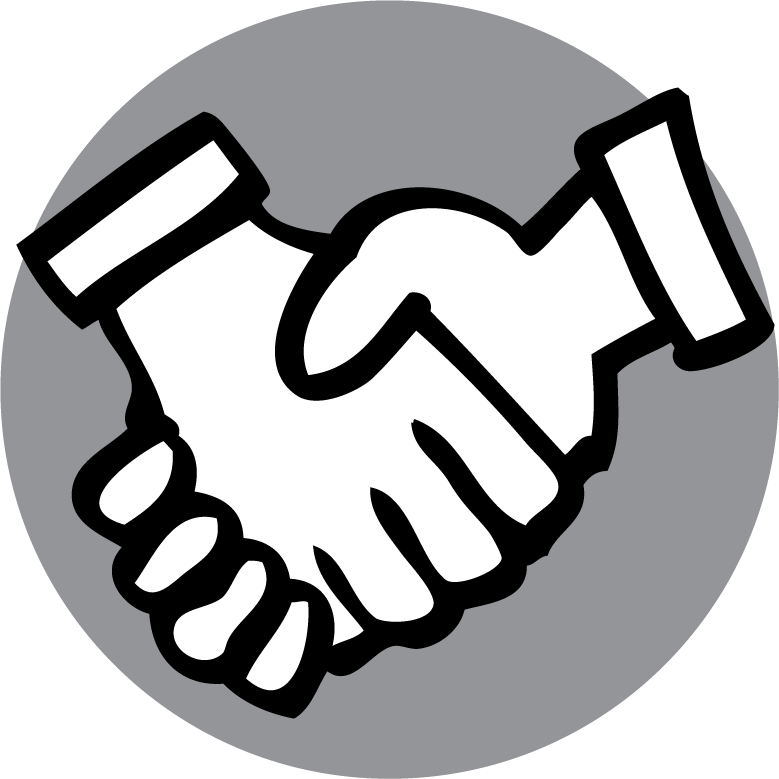 If Standard and Link Only ProgramAtSites exists for a Program, both separate and merged ProgramAtSite records will be sent to verifiers. Example: Program “Fruit Collection”, is offered at three sites: 5221 60 Street (Standard), Southeast Community Centre (Link Only), and Northeast Family Centre (Link Only). When the AVR request is sent for “Fruit Collection” and setting 6 “Send verification request to ProgramAtSite Contact if one exists…” is selected, the Program verifier receives the Program and both Link Only ProgramAtSite merged, and the Standard ProgramAtSite separately to the verifier listd on the ProgramAtSite record (if available). For a number of reasons you may want to exclude Link Only ProgramAtSite records when running certain reports or other queries inside of iCarol. Here’s a quick breakdown of the areas where you can choose to do that, and ways to otherwise be aware of these records when analyzing your database. From the “Manage Resources”, “List all Resources” tool LinkOnly ProgramAtSites can be excluded from the list by clicking “Exclude LinkOnly ProgramAtSites”. In Resource Exports, LinkOnly ProgramAtSites are flagged as LinkOnly in the “IsLinkOnly” column. We hope that this new ability to create ProgramAtSite records as Links Only rather than full, standard records will be useful to your agency. Should you have additional questions about this feature, please contact our Support Team. 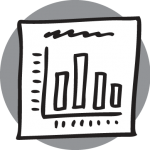 We’ve previously talked about the many ways in which your community can help you build and refine your resource database. 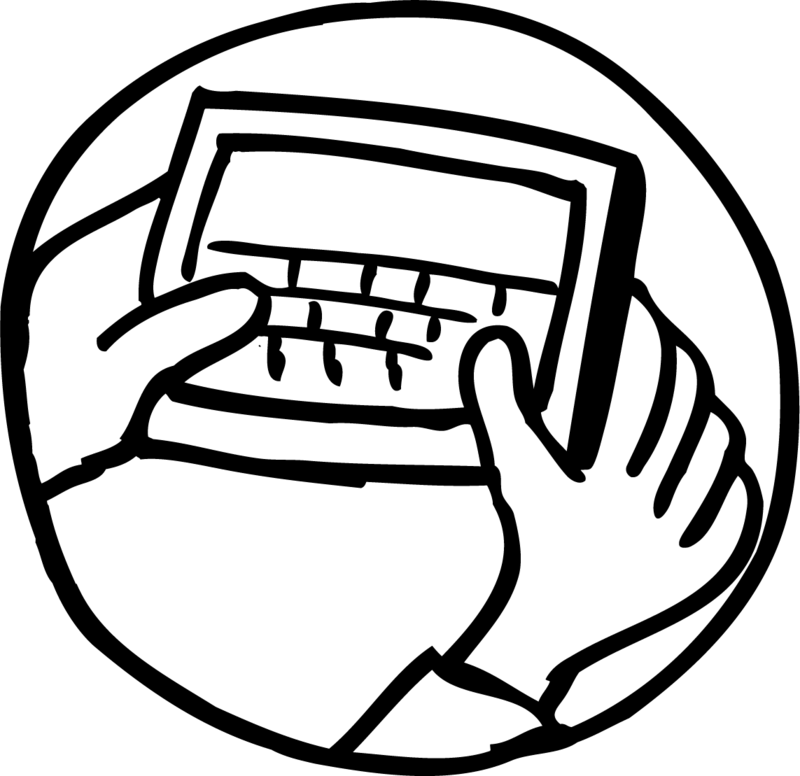 For example, iCarol’s Public Resource Directory allows you to embed your searchable database right on your website and encourages self-service searches for resources, while at the same time allowing your organization to accept feedback about a resource, or receive requests from service providers to verify or correct a record using another useful tool, Automated Verification. 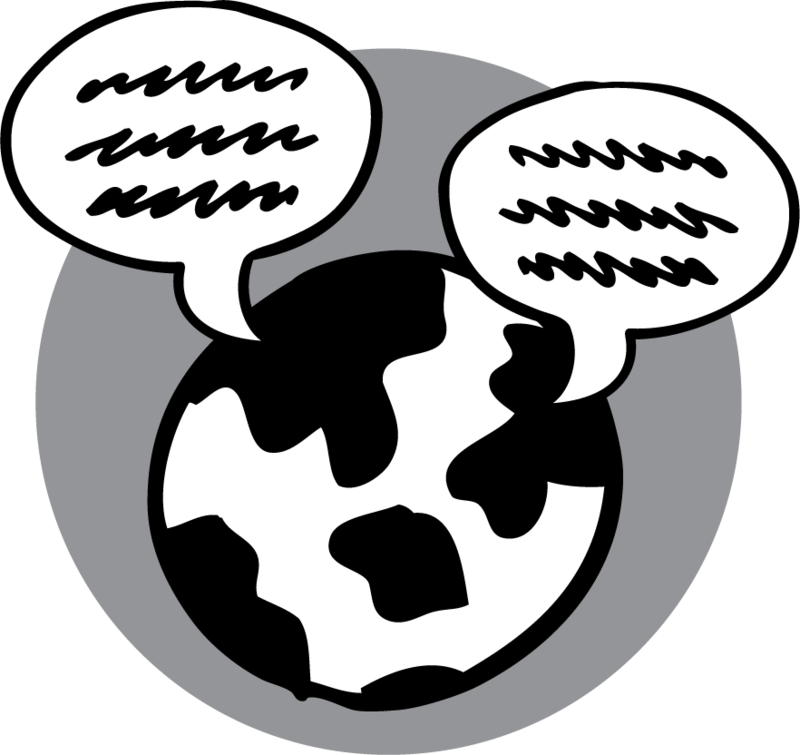 Being able to partner with your community at large, and crowd source information this way, can ultimately help you build a robust database that’s going to be super useful, and help even more people. We just added yet another tool designed to boost your referral database accuracy and comprehensiveness. 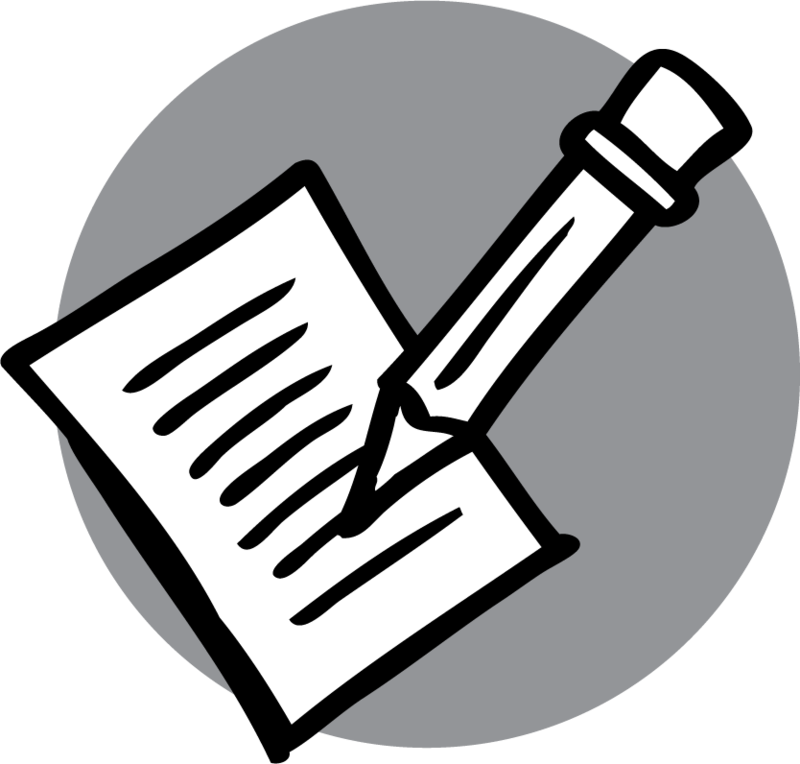 Users of Automated Verification can send a unique web link via email, in an Automated Verification request, or posted publicly on their website, that allows new organizations to submit their information. Best of all, the resulting information lands in your iCarol system as an Automated Verification response. 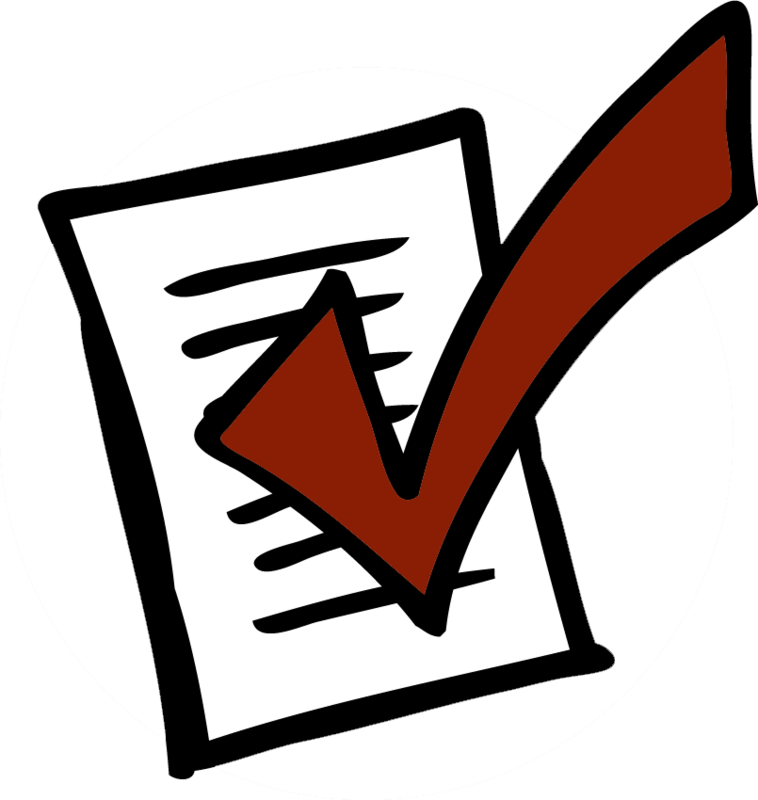 Review the submission, edit if necessary, and once accepted the new Agency is seamlessly added to your resource database! You’ll also recall that awhile ago we added the capability for responders of existing resources to add Program or Site records when submitting their Automated Verification request. If this feature is turned on, then those who are sending in these new Agency submissions will also be invited to add Programs or Sites at that same time. You must be using the Automated Verification tool in iCarol to enable these new Agency submissions or allow existing Agency representatives to add Programs or Sites. To learn more about Automated Verification, click here. If you’d like to turn on Automated Verification in your iCarol system, contact our support team. Just under the area where you’d create and edit your email templates, you’ll find a URL. This URL is unique to your helpline. 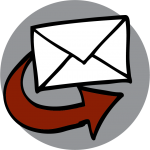 This link can be used to encourage agencies to add their information to your system, and can be shared with your community in many ways — Send it in a personal email, or include it in an email template that can be sent within iCarol via Automated Verification. You could also create a button or hyperlink text on your website that sends visitors to this URL inviting them to “Click here to add your organization to our resource database” or other language you see fit. When someone clicks on this unique URL, they’ll be guided through the process of filling an entry form that’s very similar to the one existing organizations see when they complete a verification request from you. The main difference is that this entry is blank, and grants the user the opportunity to submit all new information about a resource that may not yet be known to you. If you enabled the addition of Programs and Sites by responders, then once the Agency is added, they’ll be invited to add on that information as well. Similarly, Automated Verification responders who are simply updating their record information as part of a verification request will also be invited to add new Program or Site records when they make their updates. Once they complete and submit all their information, it arrives directly into your iCarol system alongside other verification responses. You’ll be able to tell the new submissions apart from the rest of the responses — If you look under the ‘New Record’ column, you’ll see that new resources have the word ‘True’ appear here. From there, the new record continues to behave much like other Automated Verification responses. You’ll need to review the entry and make any necessary edits. Once you save and accept the record, it will be added as a new Agency in your iCarol resource database. Important note: Once new records are accepted, don’t forget to edit these records to add any necessary custom or Taxonomy categorizations! We hope you enjoy yet another new way to invite inclusion of new and helpful resources to your database, further increasing your responsiveness as an organization, as well as the reliability of the resource information you provide to those in need. The convenience of adding these new records will mean a more complete collection of services which will ultimately help even more people in your community. Peanut butter and jelly. Chocolate and caramel. Peas and carrots. Some things just go well together! We love it when we can make features in iCarol work well together, too. 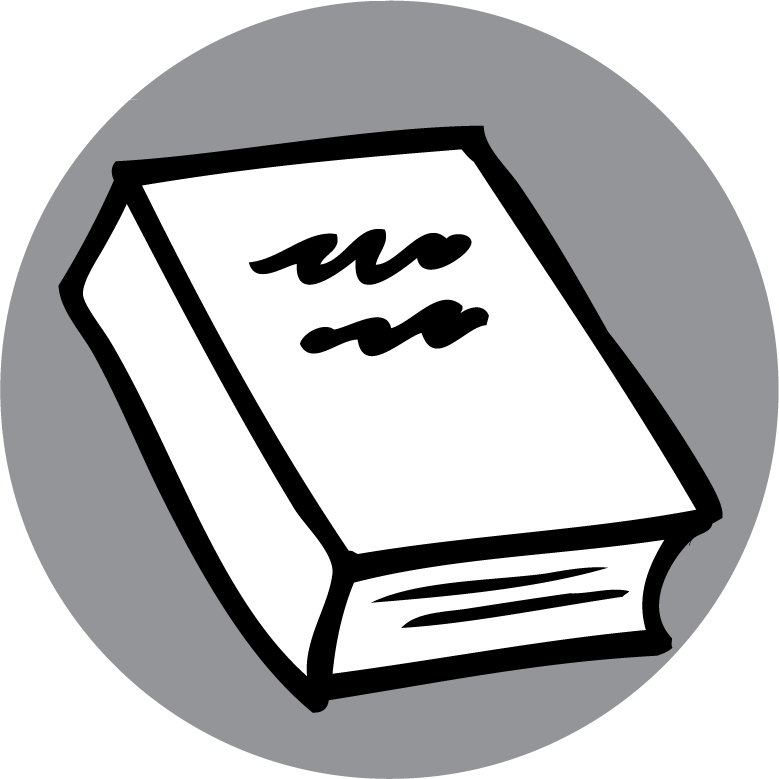 Take Automated Resource Verification and the Public Resource Directory as an example. By themselves they each have a specific and valuable role to play with your referral management. And these two features are now working together in new and exciting ways! As you’re already aware, help seekers like having self-service options, like searching online for resources. Having a Public Resource Directory (PRD) means you can embed a live search of your iCarol resource database right on your website for easy access by the public. And of course there’s lots of flexibility and control over what is seen by the public and what isn’t. But help seekers aren’t the only ones using your PRD. Staff at your local community organizations are likely going online to check out your resource directory to see what you have listed. If they see something that’s incorrect or needs an update, they could call or email you. If you use Automated Verification, you could then send them a verification request that lets them quickly and easily see what you have on record, make suggested updates, and send that back to you so you can review and update records with the click of a button. 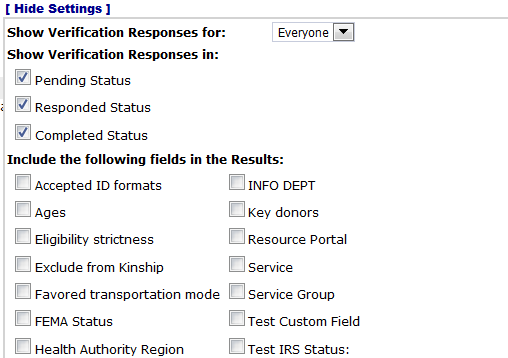 But let’s see if we can simplify that process even further: Now, when you have both the Automated Verification and the Public Resource Directory features enabled in your iCarol system, you have access to an advanced feature that allows Resource record verifiers to initiate a new verification request directly from their Resource records in the PRD. 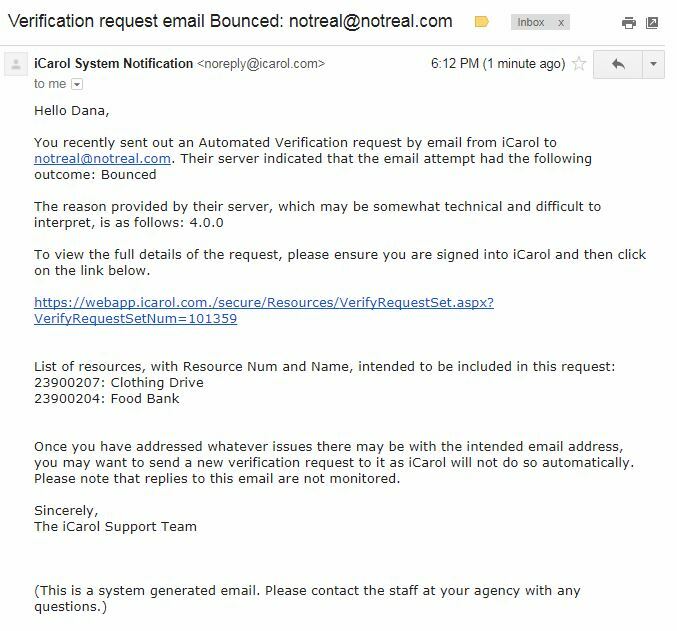 The public user has to fill out the security captcha, then click the button below, and this tells iCarol to send the verification request using the template and settings you’ve specified (See below for more on that). The request will be sent to the email specified on the resource, requesting a review. And if a record does not have an email then the disclaimer, captcha, and email button will not appear at all for that record, so verification Requests cannot be initiated. 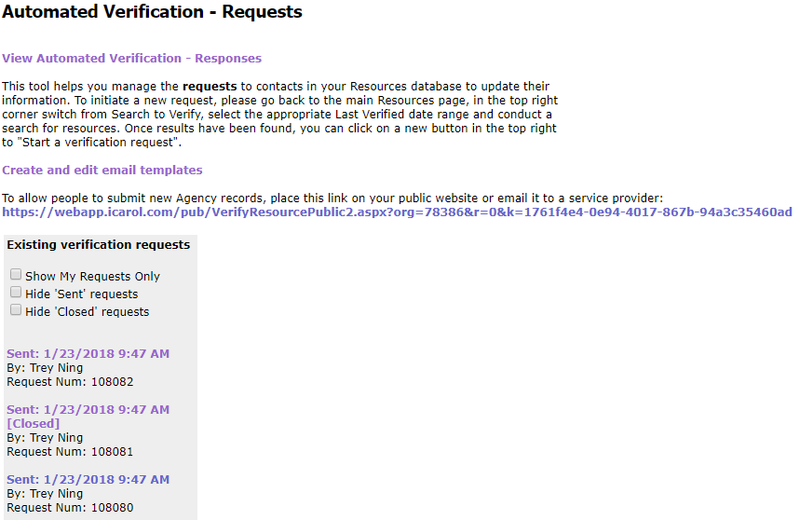 When someone in the public initiates that verification request on your PRD, your staff with the “Resource verification requests from service providers” setting enabled on the Notification tab of their profile will receive an email. And the resource verifier, depending on the email on record and the saved Automated Verification settings, will receive an email with their unique verification link. So, how do you get this to work for you? 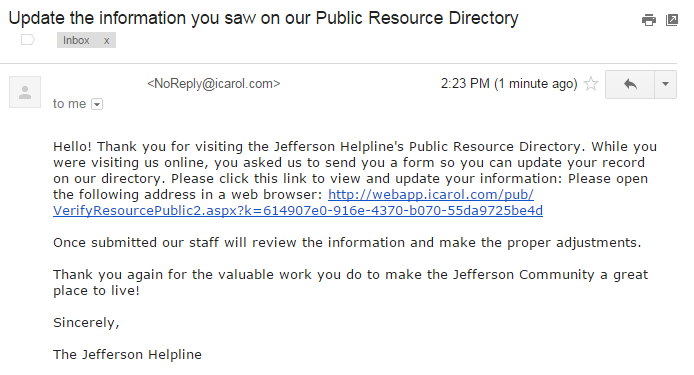 Well first, you must subscribe to both Automated Verification and the Public Resource Directory. If you want to start subscribing or just want to learn more about these features, please contact our support team. Not using iCarol yet? Please contact us for a demo and free trial! 1. On the PRD settings page, make sure that the highlighted setting below is checked, and click the Save button. 2. 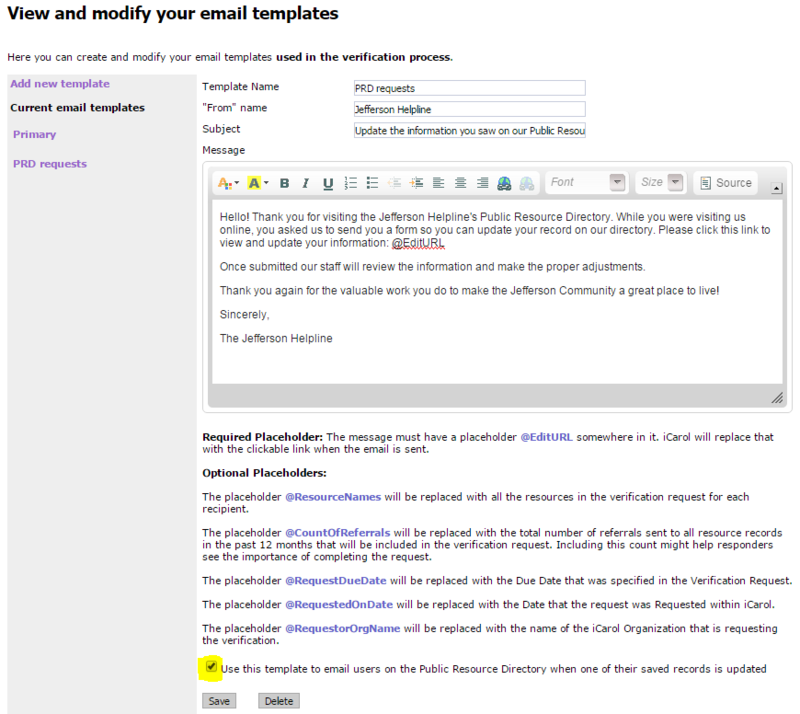 In your Automated Verification settings, create a new email template that will be used for these PRD initiated requests, and check the box for “Use this template to email users on the Public Resource Directory when one of their saved records is updated” before saving the template. 3. Choose the Automated Verification settings you’d like to apply to all the PRD initiated requests by either finding an existing Automated Verification Request where suitable settings were chosen, or create a new request and set it up how you’d like all PRD initiated requests to be set. 4. 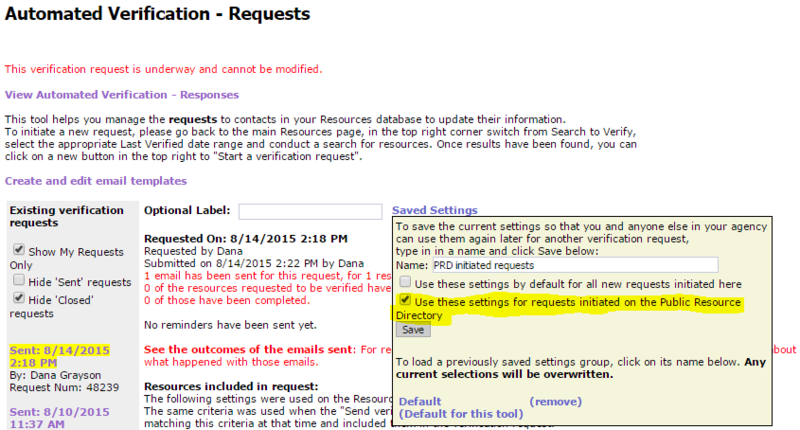 Use the ‘Saved Settings’ tool to save these settings for PRD initiated requests. Make sure you check the highlighted setting before clicking the ‘Save’ button. Once you’ve taken these steps, you are all set up! Now if someone visits your PRD and notices that their resource record is due for an update or needs a correction, they can easily initiate the request and receive the link to update their records. Not using the PRD or Automated Verification yet? Or maybe you’re using one, but not the other? Contact us today to get both of these features working together to boost your referral service!